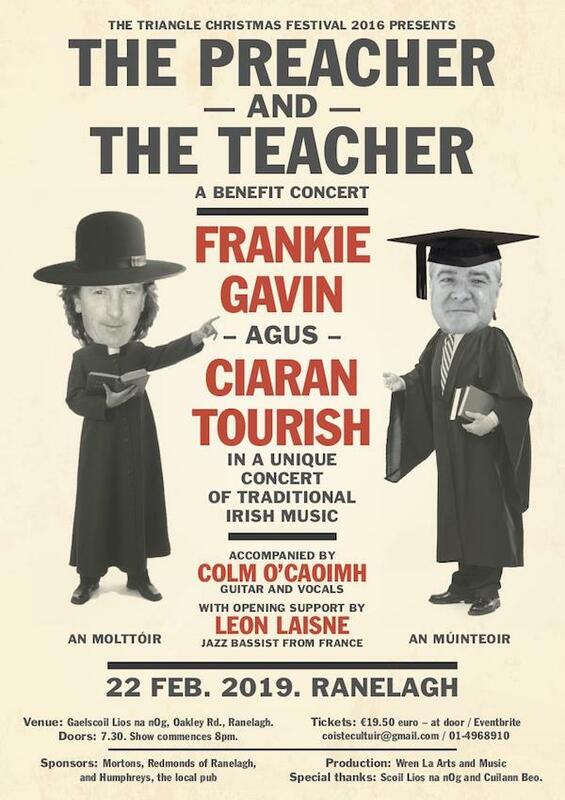 Frankie is playing a benefit concern with Ciaran Tourish. Tickets and contact details on poster below. 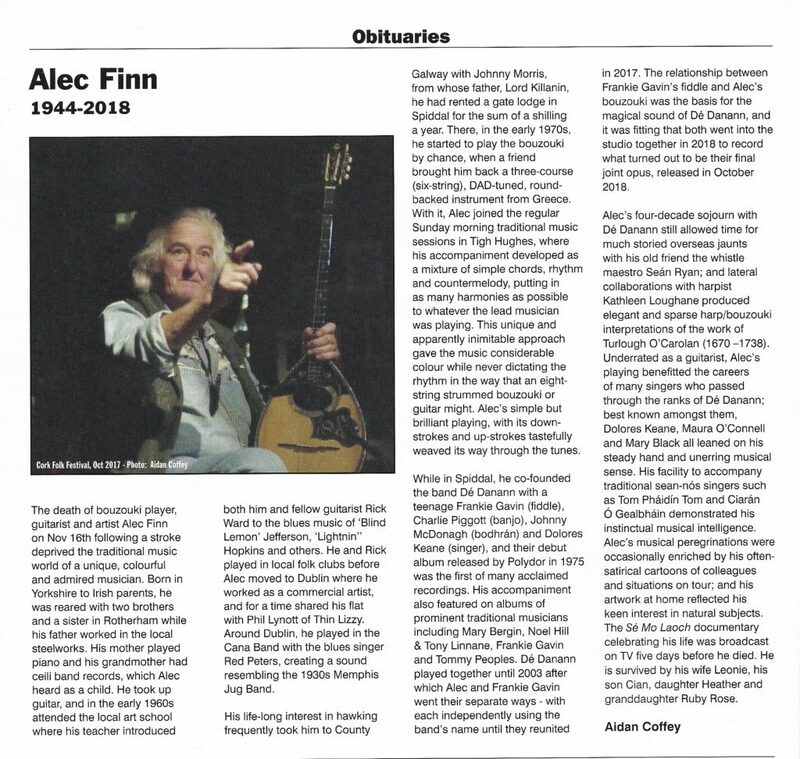 The following obituary for Alec Finn appeared in the January 2019 edition of Living Tradition magazine. It was written by one of Alec’s De Danann bandmates, accordionist Aidan Coffey. 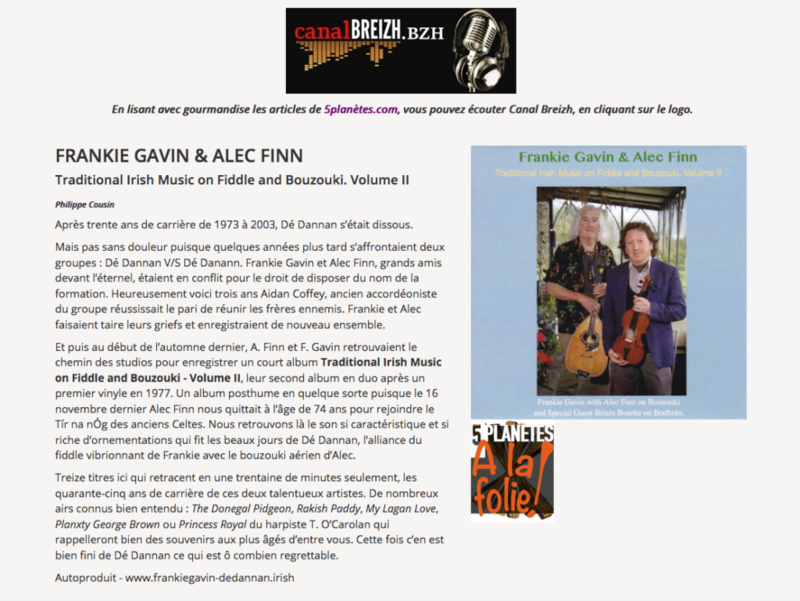 The French website 5 planètes has recently published a review of Alec and Frankie’s Traditional Irish Music on Fiddle and Bouzouki Volume II. Here it is in French. Below is an English translation. 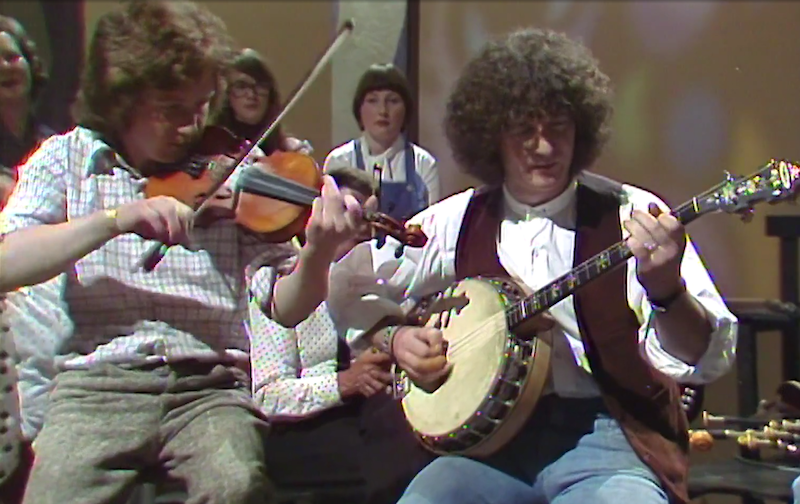 After thirty years, from 1973 to 2003, Dé Dannan broke up, but not amicably as a few years later, two different groups were in competition each other: Dé Danann versus De Dannan . Frankie Gavin and Alec Finn, great friends, were in conflict over the right use the group’s name. Fortunately, three years ago Aidan Coffey, one of Dé Danann’s former accordion players, succeeded in bringing the rivals together. Frankie and Alec put aside their grievances and recorded together again. 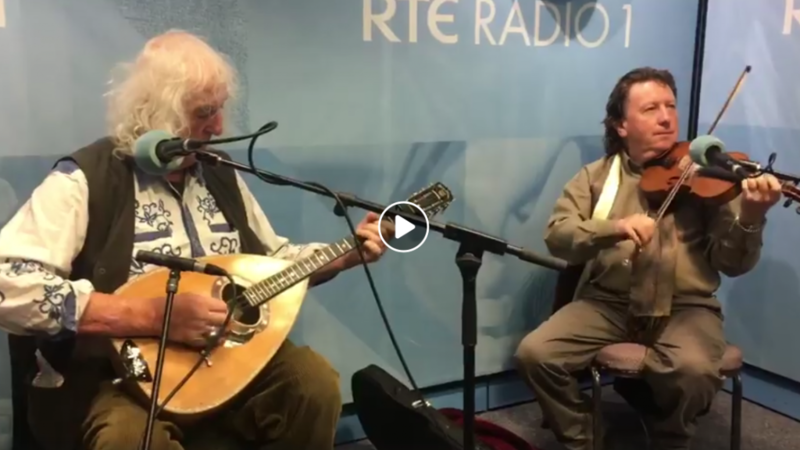 And then early last autumn, A. Finn and F. Gavin were back in the studio recording a short album, Traditional Irish Music on Fiddle and Bouzouki – Volume II, their second duo album – their first was a 1977 vinyl LP. This turned out to be a posthumous album, as, on November 16th, the 74-year-old Alec Finn, left this world for Tír na nÓg. 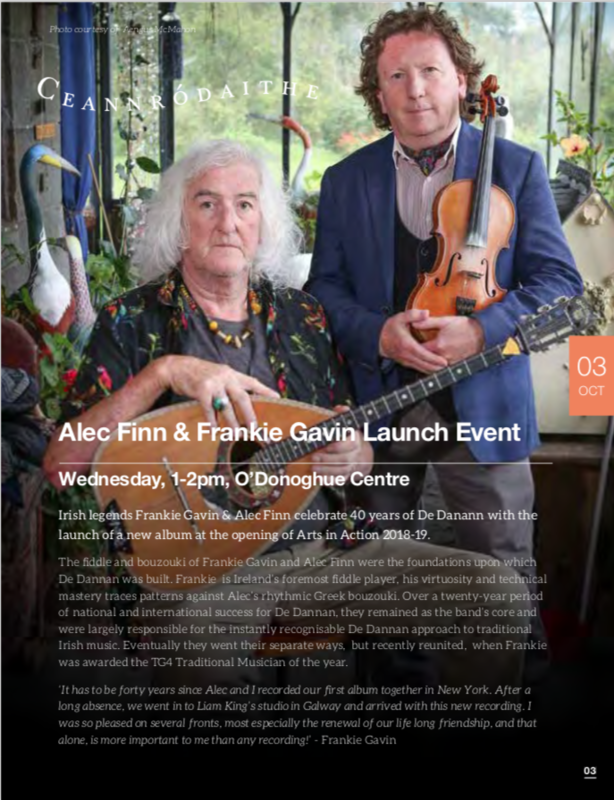 This new album has a sound, rich in ornamentation that takes the listener back to the best days of Dé Dannan: a sound based on the interplay of Frankie’s vibrant fiddle with Alec’s hypnotic bouzouki. The thirteen tracks here retrace in just thirty minutes, the forty-five year career of these two virtuoso musicians. 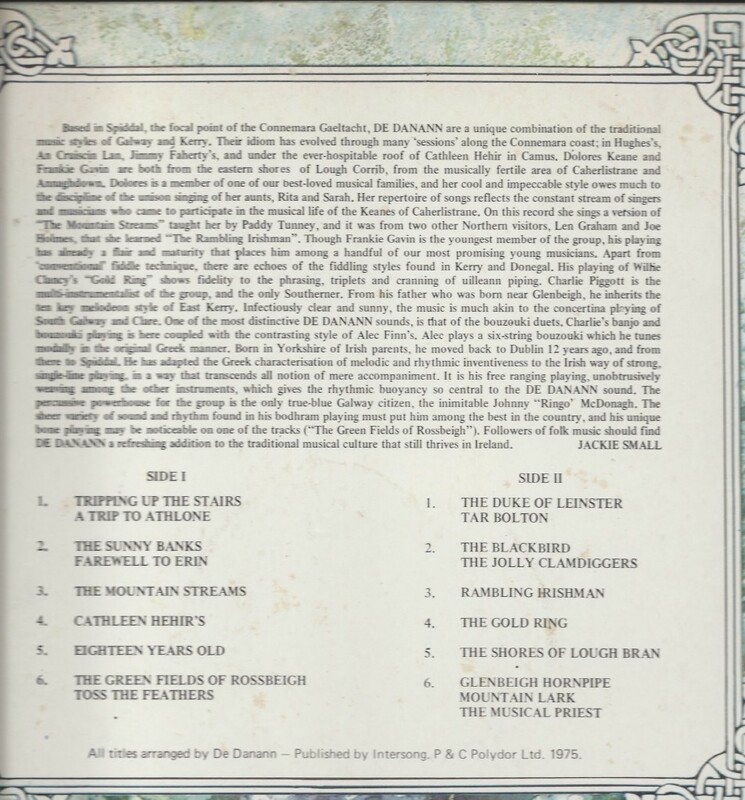 The album which includes many well-known tunes: The Donegal Pidgeon, Rakish Paddy, My Lagan Love, Planxty George Brown and O’Carolan’s Princess Royal will bring back many happy memories for anyone who remembers the early days of Dé Danann. Very sadly, this time it really is all over for Dé Dannan. The passing of Alec Finn earlier this week is a great sadness to everyone who knew him and loved his music. He had recently recorded and launched his second duo album with Frankie Gavin. The two had made up their differences and old De Dannan line-ups had played a few gigs together. Frankie was hoping to arrange one more band gig, but that was not to be. The TG programme devoted to Alec, which was broadcast on the evening of Sunday 11 November is a fitting tribute to this great musician – there will be many more tributes. 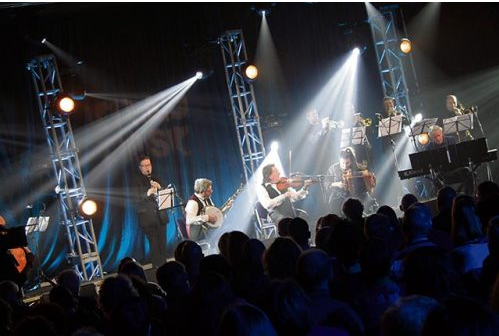 The Roaring 20s Irish Orchestra played a blinder at the 20th Return to Camden Festival at Kings Place London. On this occasion they were a four-piece – i.e. without brass, double bass or clarinet. 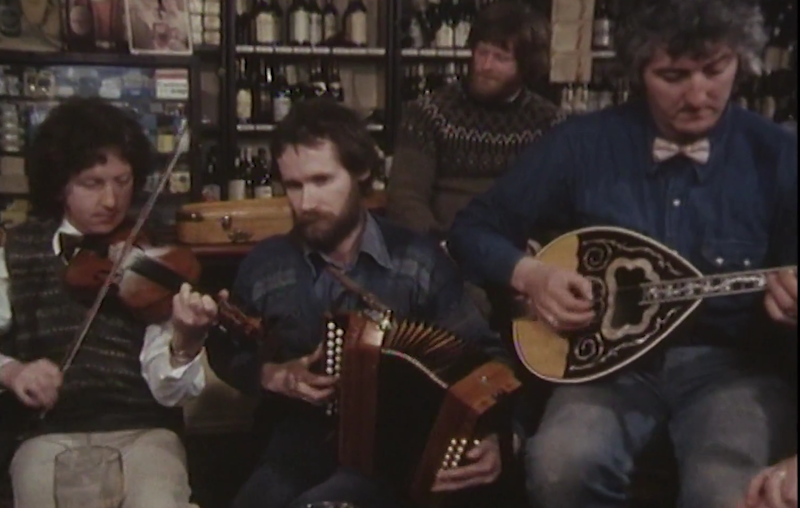 In 1977, an LP appeared on the Shanachie label titled simply “Traditional Music of Ireland – Fiddle and Bouzouki.” The musicians were friends in their early twenties, Frankie Gavin and Alec Finn, probably better known then as members of De Dannan, an emerging, high-octane band with a new approach to traditional Irish music. Frankie Gavin was already recognised as one of the best fiddle and flute players of his generation having won all-Ireland titles on both instruments at the age of 17. 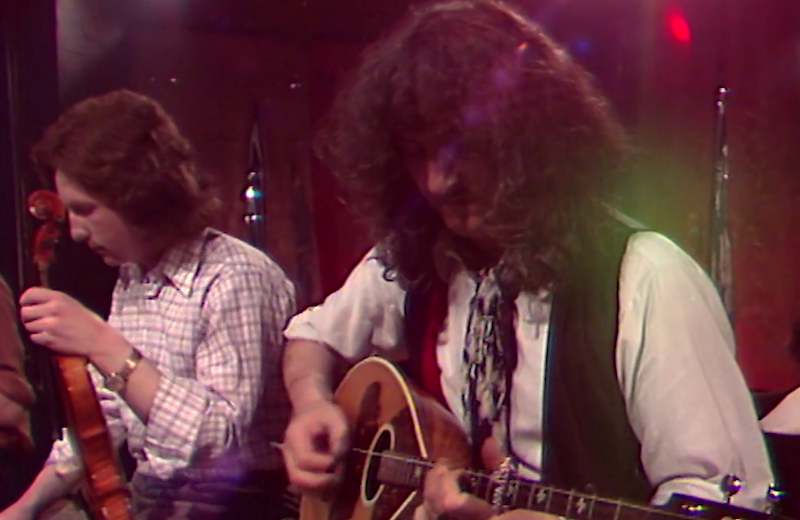 Alec Finn chose the Greek bouzouki as his instrument rather than the ubiquitous guitar. This unique fiddle-bouzouki combination was original, and the sound they made together was highly infectious. 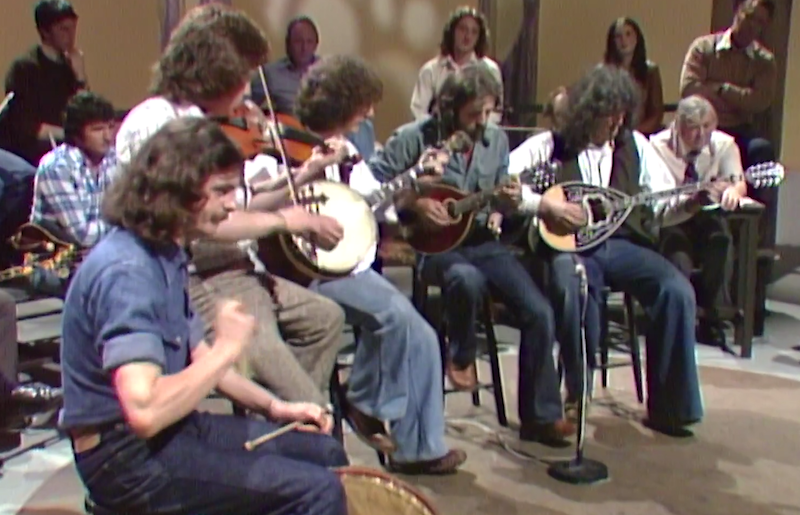 By the time that 1977 recording was reissued on CD in 1994, it was part of the “Masters of Irish Music” series – and rightly so. 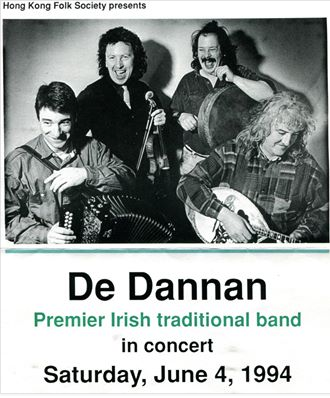 There followed a twenty-year period of national and international success for De Dannan, the band’s forever-changing line-up providing a sort of apprenticeship for many virtuoso singers, accordionists and percussionists who joined for a time and then moved on to solo careers. But throughout this period, the band’s core, Frankie and Alec, remained and were largely responsible for that instantly recognisable De Dannan sound. But no band lasts forever and when the break-up came, Frankie and Alec went their separate ways to form new bands. Until recently it looked as though they would never share a stage again, but encouraged by musician friends, they made up their differences and decided to play together again. 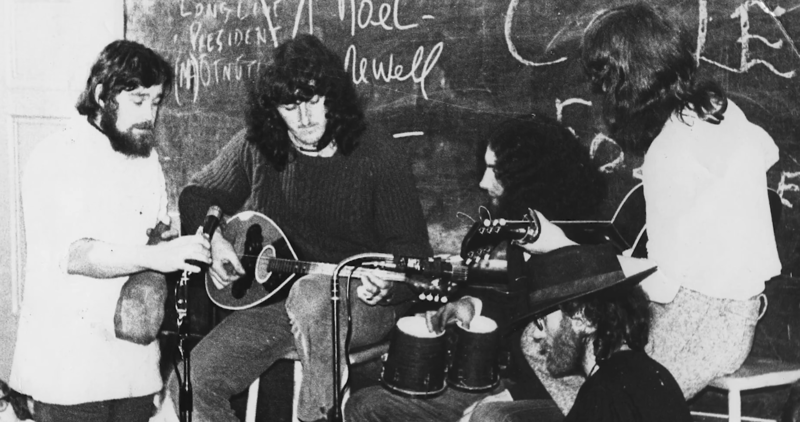 Since then, they have performed on several occasions, notably at the Gradam Ceoil Awards, where Frankie was nominated as Traditional Musician of 2018, and perhaps most movingly in July at Traidphicnic Festival in Spiddal, where De Dannan played their first gigs in the 1970s. 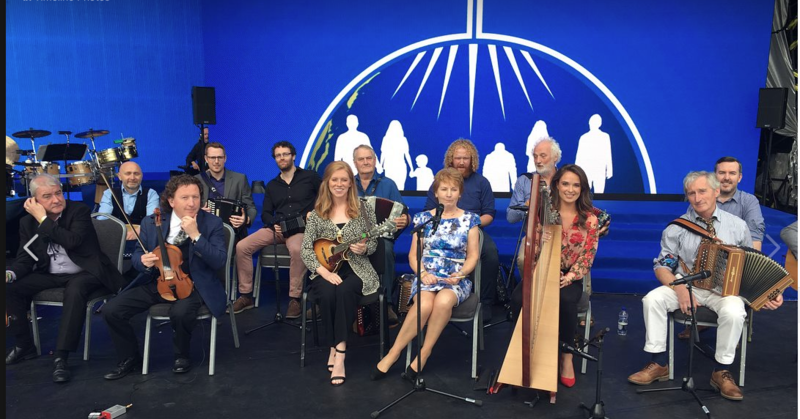 This occasion was recognised by De Dannan’s many fans as being very special, the more so as they were joined by the band’s first singer, Dolores Keane. Now, to the delight of their many followers across the world, they are launching a completely new recording. 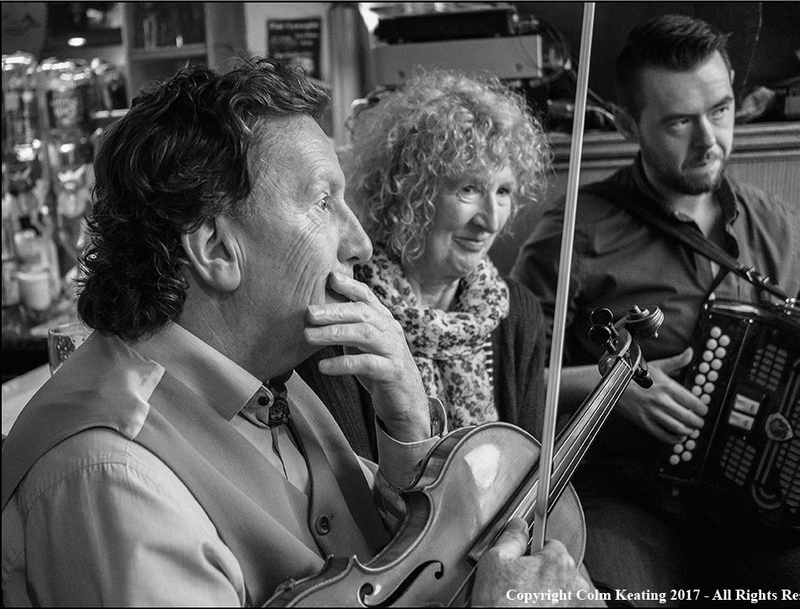 On the new recording, Traditional Irish Music on Fiddle and Bouzouki Vol II, their sound is as fresh and exciting as when they first recorded together forty years ago. Frankie and Alec are indeed still masters of Irish Music. 25th August Frankie Gavin played for the concert in Croke Park to celebrate the visit of the Pope to Ireland. He performed with his brother Sean, sister Noreen O’Sullivan and his daughter Ruby Harris-Gavin. Here they all are together with the Begley family. 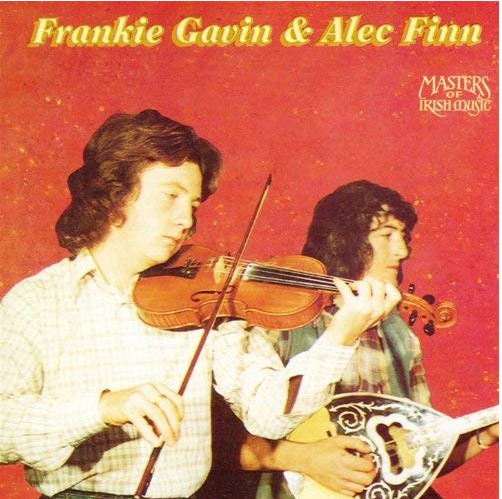 Frankie Gavin and Alec Finn have recently completed a new recording – 40 years after their first duo album, which came out as an LP in 1977 and was reissued on CD in the Masters of Irish Music series in 1994. It has 13 tracks but at the time of writing no title or cover. It will be launched at 1.00-2.00 on 3 October, O’Donoghue Centre, NUI Galway on the occasion of the opening of Arts in Action 2018-19. Below is the 1994 re-issue of the recording on CD. The new album, By Heck, is out! 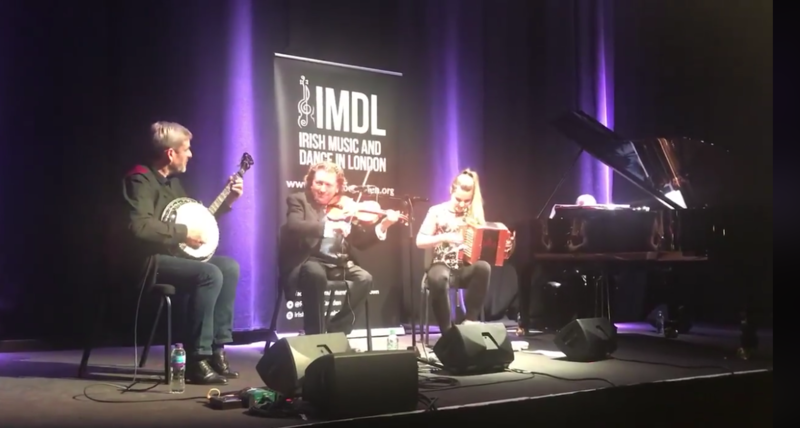 Here’s a live video of one of the tunes on it, performed at the All-Ireland Fleadh in Drogheda on August 19. 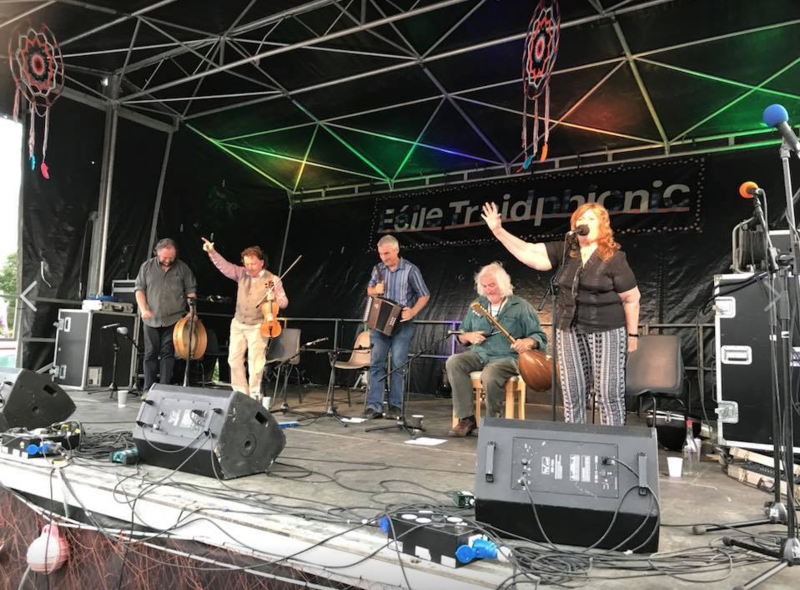 The band which played at Féile Traidphicnic in Spiddal on July 7 was one of the great De Dannan line-ups from the past: Frankie Gavin, Alec Finn, Aidan Coffey, Colm Murphy and Dolores Keane together again. A few days before the event Alec Finn fractured his ankle and it looked unlikely that he would perform. George Grasso, bouzouki player with The Provenance, was standing by and had learnt all the material ready to step in if needed, but Alec arrived unexpectedly 15 minutes before the start of the concert and had to be helped on to the stage, so the gig went ahead with the advertised line-up. According to people who were there, the occasion was magic, nostalgic and slightly surreal. Karen Ryan commented: I’m listening to the sounds of my childhood on a beautiful Summer’s evening in Spiddal. Huge congrats to Bridge Barker, Steve Sweeney and all their team on a great Féile Traidphicnic so far and for getting De Dannan together for this evening’s gig. Dolores Keane, who has not sung with the band for many a year was in great shape and enthusiastic. She sang five songs: Rambling Irish Man, Teddy O’Neill, Far Away in Australia, My Own Dear Galway Bay and Caledonia. Needless to say the audience loved her. It has been suggested, by people in the know, that this is probably the last time that these great musicians will ever get together. But who knows? In a year when Frankie Gavin and Alec Finn have made up their differences, anything could happen. 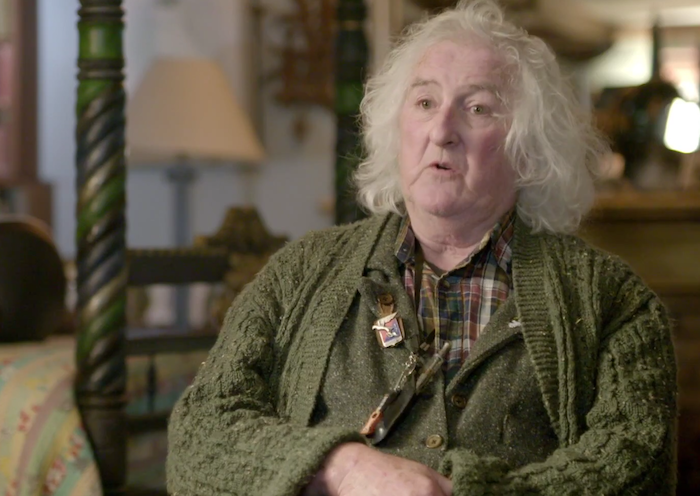 “I was recording in California last year,” he says, “and did a couple of tracks with two fiddles and brought them back to Ireland and started adding stuff onto it, like Brian McGrath on keyboard, and a few more fiddle tracks of my own. Then I thought it would be great to have a team of fiddle players and I could have more fun doing tunes and playing around with them, because I love to improvise and do harmonies and stuff like that when playing. It would be great to have a few other fiddle players onstage. 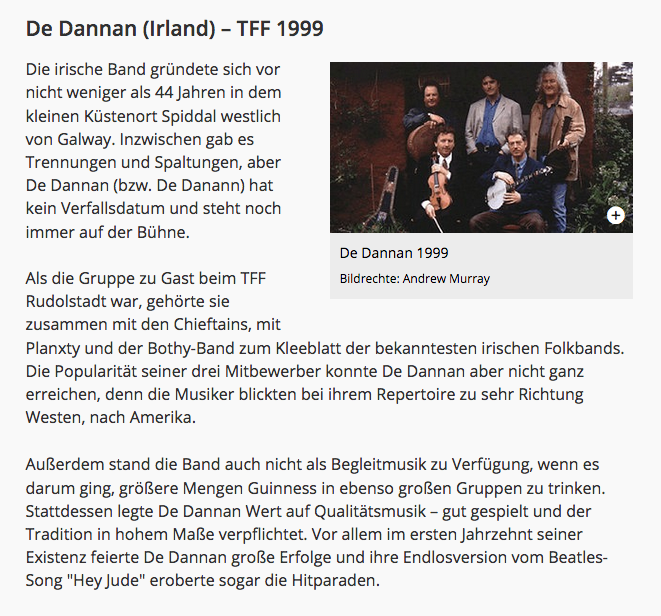 The German Broadcasting Company Mitteldeutscher Rundfunk transmitted a concert De Dannan played at the festival TFF Rudolstadt in 1999. Featuring singer Andrew Murray. Here are a few of the tunes and songs. Proof if proof were needed that this gig actually took place. It’s a few years now since Frankie and Alec shared a stage. 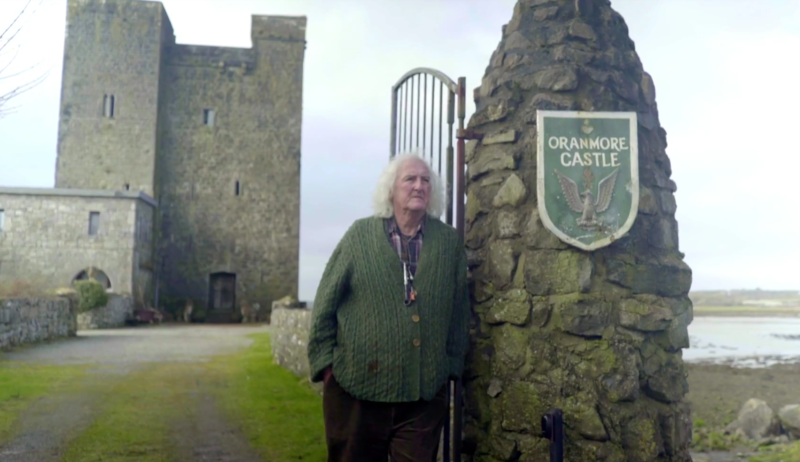 The Corner House Set – The Oak Tree from Kevin Macleod on Vimeo. The Corner House Set – Hornpipes from Kevin Macleod on Vimeo. 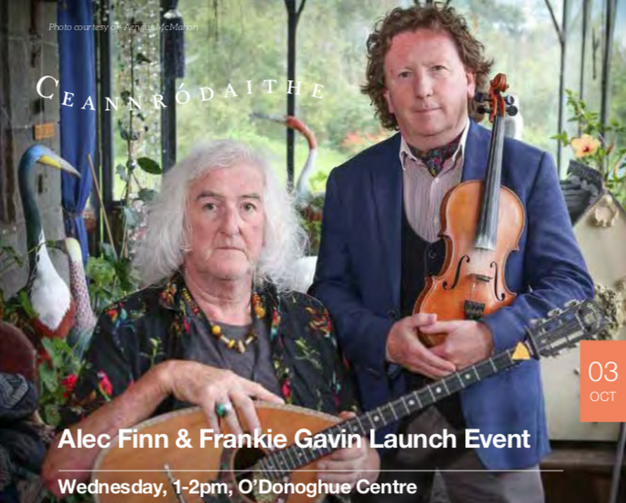 It’s many years since Frankie Gavin and Alec Finn played on the same stage. When the original De Danann ceased to be in 2003, these two founder members and lynchpins of the band for so many years went their separate ways. 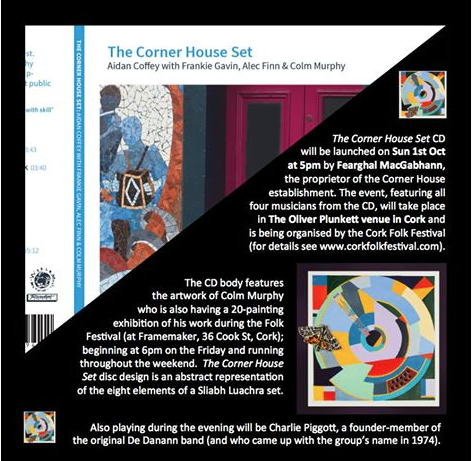 But now they will playing together again for the launch of the CD ‘The Corner House Set’ a project set up by long-term De Danann accordion player Aidan Coffey. In addition to Frankie, Alec and Aidan, the line-up includes Colm Murphy a name that will be familiar to all followers of De Danann. 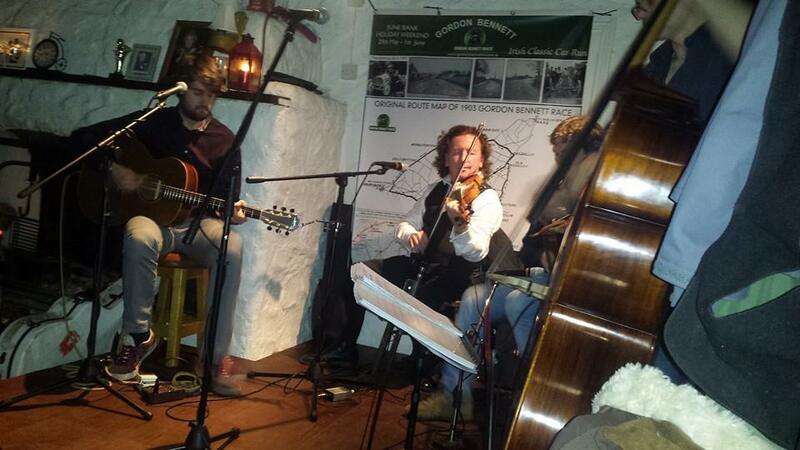 From Bunmahon Co. Waterford, he joined De Dannan in 1988 and spent seven years touring and recording with them. He also recorded an album with Seamus Creagh in 1999 and last year he released a brilliant new album ‘The Corner House Set’. Frankie discovered the music and songs of The Flanagan Brothers in the early eighties and his musical path changed forever! The 1920’s were an era of extraordinary recordings of emigrant Irish music in New York, and The Flanagans were perhaps the most successful band playing to huge crowds, in dance halls and even the Vaudeville circuit. De Dannan recorded a cover of ‘My Irish Molly Oh’ and had a huge hit with the song, and the rest is history. A founding member of De Dannan, Alec Finn has been integral to the arrangement and production of all the group’s albums and live performances. He plays a round-backed Greek bouzouki; one of the older style trixordo three course (six string) instruments tuned DAD. Alec’s solo album is entitled:”The Blue Shamrock” – Irish airs played on guitar and bouzouki. He has taught master classes at The Irish World Academy of Music in the UL, and at the Catskills Festival of Music in New York. Colm Murphy is the bodhrán tutor at the School of Music, UCC. His 1996 recording An Bodhrán – the Irish Drum is considered the benchmark album of traditional playing. 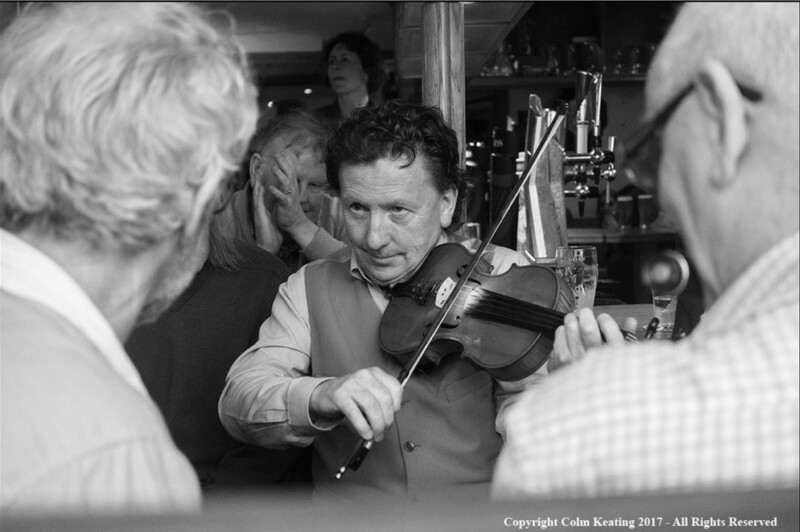 A member of De Dannan for almost twenty years, Colm Murphy has played and recorded with many of Ireland’s traditional greats, including Altan, Micheál O Suilleabháin, Martin O’Connor, to name but a few. Colm will be holding an exhibition of his new paintings at The Framemaker during the folk fest weekend. 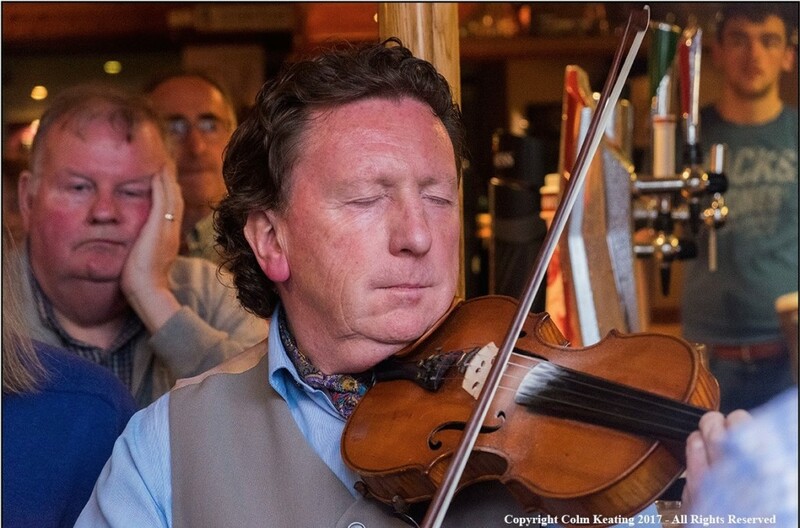 Photos of Frankie at Willie Week , Milltown Malbay, all photos by Colm Keating. Frankie Gavin in Clancy’s…photo taken outside through the window, while Alan O’Leary looks on. • Great photo just appeared on Facebook: Aidan Coffey with Frankie Gavin, Colm Murphy and Alec Finn. 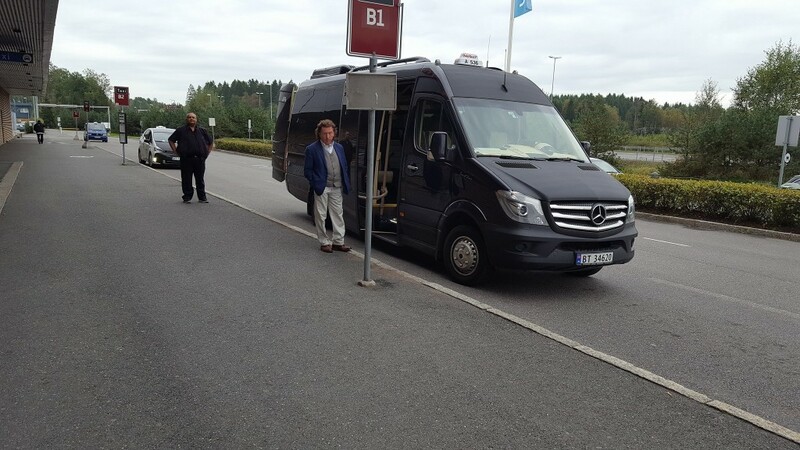 Frankie looking cool near the Norwegian tour bus taking him and presumably the rest of the band to their gig in Oslo. This video has just appeared on Facebook. Must be late 1970s or early 1980s. 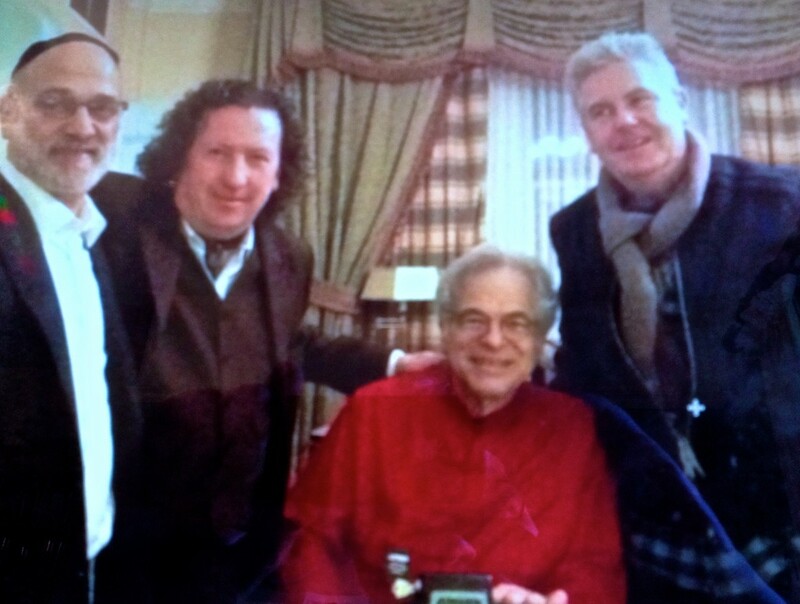 Frankie Gavin was invited to the 20th anniversary of Itzhak Perlman’s In the Fiddler’s House in Boston. Frankie Gavin, Noel Hill and Arty McGlynn played Finbarr Dwyer’s / The Ivy Leaf / Molly Bawn on a a programme broadcast on 25th February on Radio RTE 1 Na Gaeltachta Their set is on at about 1.27. Poem inspired by Frankie Gavin and Paddy Canny playing together. 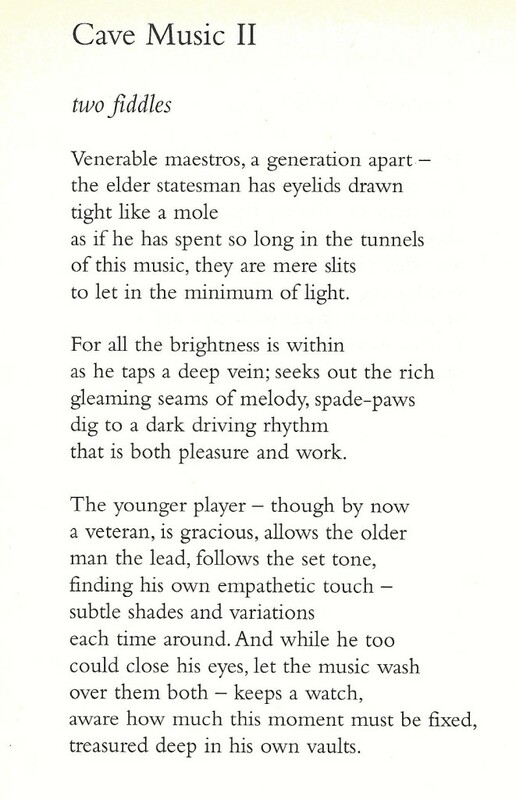 It’s one of several poems inspired by traditional Irish musicians in the collection Session by Pete Mullineaux. You can watch Frankie Gavin and Paddy Canny playing together here on YouTube. Find out more about the book and Pete Mullineaux here. Session is published by Salmon Poetry. 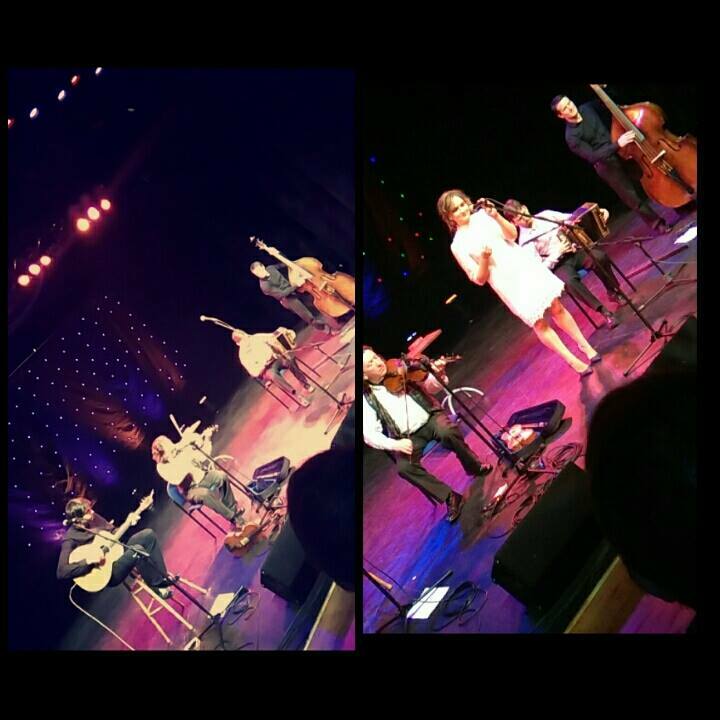 Frankie Gavin has featured on two recently released CDs – both purchasable here. 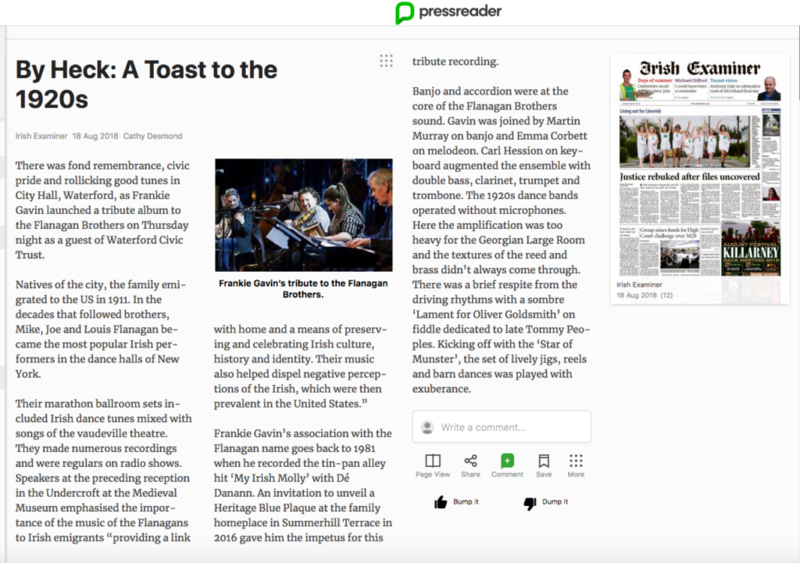 • The Master’s Return, A Tribute to Paddy Killoran (Frankie Gavin, Malachy Bourke, Brian Bourke) got a great review in Living Tradition magazine. This recording was also reviewed here in the Irish Times. 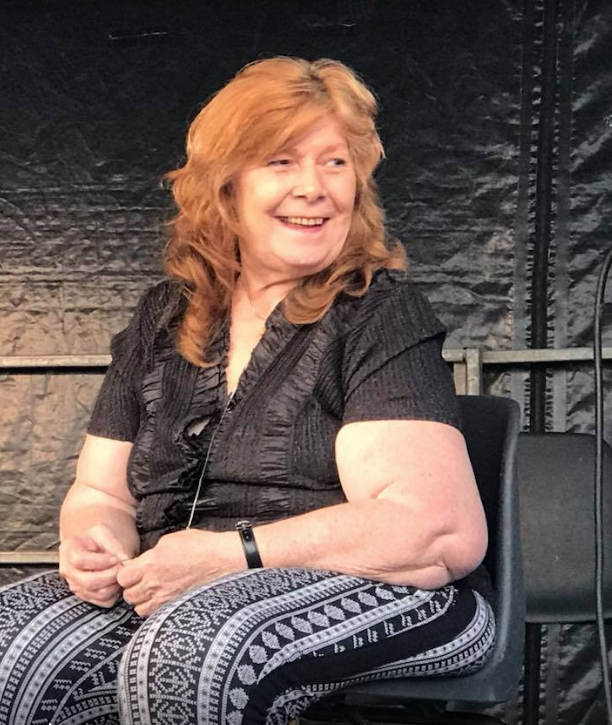 Prior to the band’s concert at Roscommon Arts Centre, the Roscommon People published this portrait of Bernadine Casserly who sang with the band for a time after Michelle Lally left. Bernadine Casserly is a woman on the way up in the Irish music world. The young Frenchpark native is a former ‘Roscommon’s Got Talent’ winner and is well-known as a wedding singer all over the West of Ireland. However, her career has moved up several notches since Christmas of 2014 after she got a call to join the world-renowned Irish band De Dannan as their lead vocalist. Bernadine Casserly (28) is very relaxed and laid-back and a brilliant interviewee – a young woman who is friendly and outgoing and extremely grounded. When I met her at her home in Frenchpark last weekend she explained how she comes from a musical household – although she didn’t start singing until she was well into her teenage years. Lessons followed, and they in turn were followed by Bernadine attending the odd music session. She didn’t take part however, preferring to play her music at home. A “little band” was formed in the Casserly household! Bernadine began to take singing seriously when she was told that she had a talent for it. “I was singing in choirs and in the Church and then I started doing vocal training down in Sligo.” After a couple of years Bernadine was now working in Frenchpark, but her singing talent came to the fore again when she won a major talent show which was held in Roscommon town eight years ago. Bernadine met up with Frankie and by January she was playing her first gig for De Dannan, down in Clare. “It was a real nervous time because I had two days to learn a load of new songs. The band is so well-known that you have to make sure you don’t mess up the words because at their gigs everyone in the audience knows them! “It’s busy enough but not crazy with De Dannan and that suits me because I am working here in Frenchpark and I have the weddings too. “We are doing three or four gigs a month with De Dannan at the moment and I have to say I love it. We were over in France recently in Lille and played at a festival – that went well. The line-up now is Frankie Gavin, Colm O’Cuiv from Kilkenny on guitar and Dan Bodwell on bass and Barry Brady, who is a Roscommon man. He plays the box. “Actually we are opening the Boyle Arts Festival on the 24th of July and we are really looking forward to that. It can be very busy. For instance, recently I was singing at a wedding in Leitrim and I had to be in Kerry that night for a gig, so that’s what can happen.” Bernadine loves all sorts of music. Bernadine is doing a lot of travelling all around the country but she still lives at home with her parents Brian and Mary. She has two brothers and two sisters. “I have been working with Frenchpark & District Childcare for eight years. They have been brilliant to me…and very understanding with regard to time off for weddings and gigs. Only for them I wouldn’t be able to do what I’m doing at the moment. We will see what the future brings. But it’s going well at the moment” she concluded. A cup of tea and two beautiful scones made by Bernadine’s mother, Mary, finished the evening off in Frenchpark. I left the company of Bernadine Casserly with a clear sense that there is only one direction in which she is heading – and that’s upwards. It was a pleasure to meet her. Note: Bernadine has released a single, ‘Calico Sky’, which is a reworking of an old Simon and Garfunkel song. Bernadine’s single is receiving a lot of airplay on radio stations around the country. She intends to release another single over the next few weeks.